House Democrats are jockeying for leadership positions ahead of what they believe will be a return to the majority party after Tuesday’s midterm elections. But as Nancy Pelosi (D-CA) and Steny Hoyer (D-MD) plot a return to speakership and majority leader respectively, the Congressional Black Caucus is signaling it wants one of its own in at least one of the top two spots in House leadership. 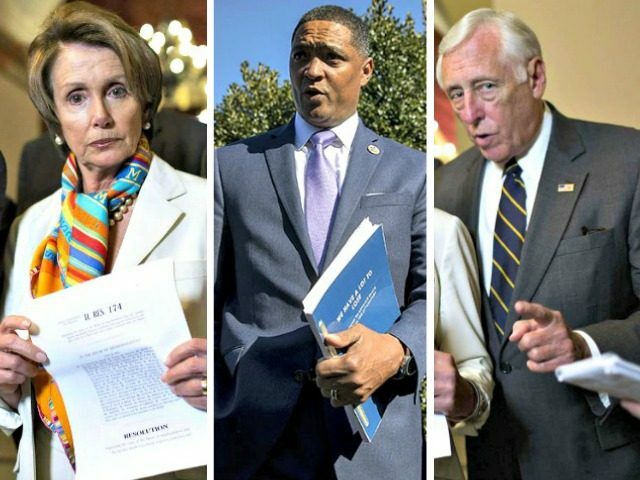 “Over the past couple of weeks, several of our colleagues have respectfully shared letters of intent expressing interest in various House Democratic Caucus leadership positions,” Rep. Cedric Richmond (D-LA) said in a “Dear Colleague” letter distributed on Thursday and included in a Politico report. “It is within that context that I’d like to reiterate that if there is any change in our top leadership positions the Democratic Members of the CBC endorse African-American representation in at least one of the two top positions of elected House Democratic Caucus leadership,” the letter said. For years, James Clyburn (D-SC) — first elected to Congress in 1992 after years in state government — has been the highest-ranking African-American lawmaker. Clyburn and other key black lawmakers like Reps. Maxine Waters (D-CA), Elijah Cummings (D-MD), John Lewis (D-GA) and former Rep. John Conyers (D-MI) were the driving force inside the CBC. But in recent years, with the election of Richmond and Reps. Hakeem Jeffries (D-NY) and Marcia Fudge (D-OH), more junior members have pressed for a greater role in the caucus, according to Democratic lawmakers and aides. The Politico report also implies Pelosi may be willing to throw Hoyer under the bus. “It’s incredibly unpopular to be an 80-year-old white guy at this moment in politics,” the aide said, referring to Hoyer. The Politico report also said while the younger CBC members seem to be willing to rock the boat, the most senior member has said he “has no intention” of challenging Pelosi or Hoyer. Clyburn was House majority whip from 2006 to 2010. Both Clyburn and Pelosi are 78 and Hoyer is 79.